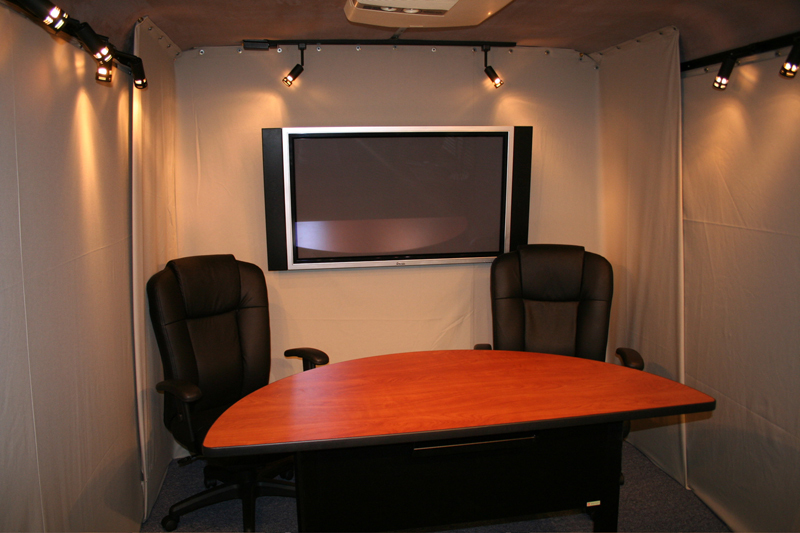 With our Mobile Studio Van we have the full advantage of a Television Studio on wheels. Our Digital Microwave system allows us to broadcast back to the head end and then out to our Local Cable Access Channel. We purchased our Digital Microwave equipment from RF Central, it allows us to go anywhere in about a ten mile radius of our school. The Mobile Studio Van is setup for doing interviews, coaches shows, etc. We have two remotely controlled camera's mounted in the van to film the talent. The talent area includes a collapsable desk with two leather chairs in front of a 42" Plasma Screen. The plasma can have various video feeds, graphics, or logos displayed on it during the broadcast. There are two 17" LCD TV's hanging on the wall in front of the talent. These can be used as a teleprompter, to show a video feed, or as a live feed monitor. Our Studio Van can do productions with up to 4 cameras using our MX-20 Production Video Switcher. All of our A/V connections are made via patch panels located inside the van. While this is a "Studio" on wheels it can also be used as a 4 input production truck for video shoots outside of the van.